Fresh out of welding school in the early-1970s, Tom Hensley could not have known what technology awaited in his journey down the metal-fabrication path. In 1987, he opened a small two-man shop in Dayton, OH, armed with a couple of welding machines and metal-cutting saws. Over time the company has added press brakes, shears, and laser-cutting machines. In the late ’90s Fab Metals relocated a few miles down the road, in a New Carlisle industrial park, adding more equipment—and customers. 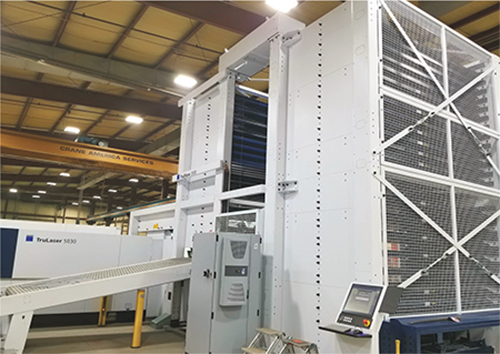 A 36-tray tower and sheet-handling system allow Fab Metals to run lights-out and ensure efficient and continuous material supply for an attached fiber-laser cutting machine. Today, Fab Metals, with nearly 60 employees, owns the whole park, having taken over adjoining space as other tenants left. Putting the finishing touches on a new 40,000-sq.-ft. building next door to its main 30,000-sq.-ft. operation, the job shop, primarily serving automotive and truck customers, will soon have 100,000 sq. ft. under roof. It certainly needs the space, with eight press brakes, welding and machining equipment, a powder-coating operation and more, all contributing to annual double-digit growth. A huge chunk of that growth revolves around Fab Metals’ laser-cutting capabilities. The company added its first machine, a CO2 model, in the mid-1990s, followed by a 4-kW CO2 machine in 2002. Due to resulting growth, in 2017 the company decided to upgrade its laser-cutting technology and capacity. The 4-kW laser, a Trumpf model with a LiftMaster material-loading arm, opened Hensley’s eyes to the benefits of automation. 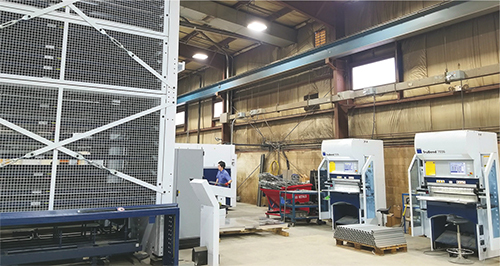 With a need for speed, by June of last year Fab Metals replaced its CO2 laser cutters with a Trumpf 3030 6-kW fiber-laser machine, backed by Trumpf material-handling automation that includes a TruStore 3030 tower and LiftMaster Compact sheet-loading/ unloading unit. 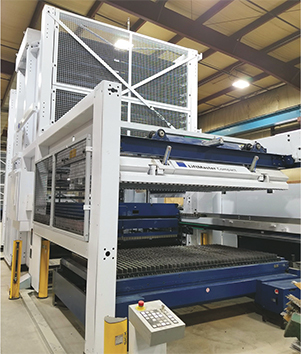 Though impressed by the speed and cut quality of the laser machine as well as the sheet-handling automation, Hensley found that growing orders taxed even this workhorse. “We still couldn’t keep up because of all of the new work we had coming in,” he says. 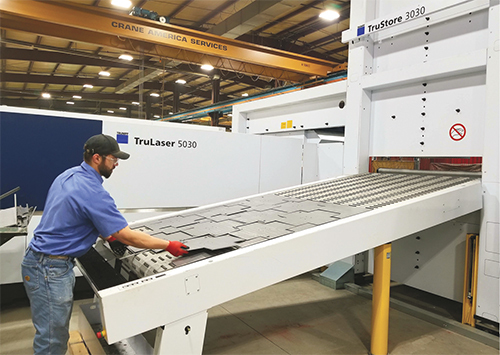 Three months after installing the new fiber-laser 3030, Fab Metals brought in another fiber-laser machine, a Trumpf high-speed 5030 8-kW model equipped with the same TruStore 3030 and LiftMaster Compact automation as the 3030. A productive find by Fab Metals is a sorting option that allows the laser-machine operator to handle parts off of the machine during production. If the operator falls behind, the system will hold sheets until he can catch up. Both machines primarily process thin stainless-steel and aluminum sheet at Fab Metals, with the 6-kW machine able to cut material to 1.25 in. thick and the 8-kW capable of 1.5-in. cuts. Company officials report significantly higher cutting speeds and smoother cut edges as compared to the old CO2 lasers, as well less energy usage, maintenance requirements and repair needs. Both fiber-laser cells run lights-out from about 2:30 a.m., when the last second-shift employees leave, until the first shift arrives by 6 a.m. Automatic dialers built into the automation can alert operators and managers to interruptions during lights-out work, and the company can monitor production via installed webcams. The towers, each with 36 shelves, automatically load the machines in tandem with the LiftMaster Compacts according to job programs, and return processed sheets back to assigned shelves during lights-out work. Come morning, processed sheets and parts can be picked back off of the shelves and routed to whatever processes come next. During attended operations, Fab Metals makes good use of Trumpf PartMaster conveyor units running off of the towers, where cut sheets and parts can route after exiting the cutting machines. The capabilities and advantages of the PartMaster option proved a pleasant surprise to Fab Metals. Hungry press brakes at Fab Metals stand at the ready to process parts after they exit the fiber-laser machine. Hensley reports significant labor savings in being able to free up employees for other work due to the conveyor’s capabilities. Having two fiber-laser machines and their attached automation options did more than just address production-workload issues. Besides the equipment, Trumpf provided all installation, integration and initial operator training, and the new fiber-laser cells—with press brakes nearby and at the ready for post-laser work—run off of Trumpf-supplied software.